Clada Group has been named as the Best Food and Drinks manufacturer in Ireland for Quality Management Systems at this year's National Q Mark Awards. Ursula Owens (right) of the Clada Group accepts the trophy for Best Food and drinks manufacturer in Ireland for Quality Management Systems at this year's National Q Mark Awards from Minister for Social Protection, Leo Varadkar. 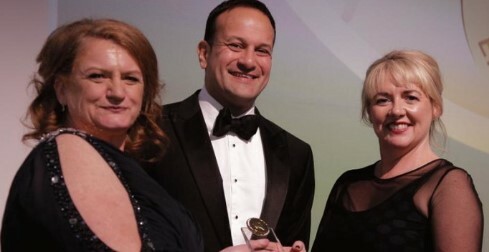 Ursula Owens (right) of the Clada Group accepts the trophy for Best Food and drinks manufacturer in Ireland for Quality Management Systems at this year's National Q Mark Awards from Minister for Social Protection , Leo Varadkar and EIQA MD Irene Collins. Hailed as "The Champions of Business Excellence", the team from Clada Group were beaming with pride as they were called to the stage to receive the winner's medal during a thrilling awards ceremony held in the Double Tree by Hilton Hotel in Dublin. The Q Mark Awards are forever associated with Quality and Excellence in the minds of Irish consumers and it is the only system which allows businesses monitor 100% of their processes and procedures 100% of the time. Winning this award has shown that Clada Group truly cares about their customers and is willing to go the extra mile to ensure that it achieves the highest possible standards at all times. Clada Group is an independent business based in Galway. Founded in 1962 by the Owens brothers, their primary business focus was the sourcing and bottling of soft drinks and water - utilising onsite fresh water springs. This has evolved into the importation and distribution of fruit and vegetables, boutique beers and wines and the provision of draught water to domestic and commercial customers. The Minister for Social Protection, Leo Varadkar TD, attended this year's National Q Mark Awards. "At the heart of the Governments strategy is supporting Irish businesses through policies to create the environment for a strong economic recovery by promoting competitiveness and productivity," he said. "Quality standards and good governance enables this growth and competiveness and it is exciting to see companies in the public, private and not for profit sectors competing side by side. These are the modern Irish businesses that are driving the engine of our recovery, and I wish them every success in the future," he added.